Original post, unaltered: Every year around this time we take up the collection known as "Peter's Pence," but just what is this collection for and why does it have this strange name? A pence, of course, is a monetary unit and six pence a day in the eighteenth century wasn't too bad of pay, but this collection of Peter's pennies originates well before the era of the swashbucklers. The Anglo-Saxon people, as you might have guessed, began this annual collection in the eighth century with the name of Denarius Sancti Petri, the alms of Saint Peter. This offering soon spread throughout Europe. 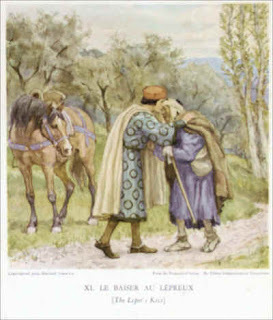 The Holy See defines Peter's Pence as "the name given to the financial support offered by the faithful to the Holy Father as a sign of their sharing in the concern of the Successor of Peter for the many different needs of the Universal Church and for the relief of those most in need." We see from the earliest days of the Church the great care that Christians are to have for one another and, indeed, for their fellow man. We cannot sit idly by while so many people are suffering from lack of food, shelter, medical care, etc., etc., etc. 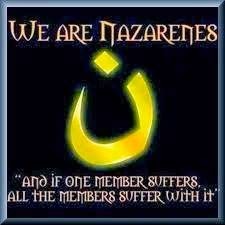 We must do our part to help them and our sharing in Peter's Pence is a way to meet the duty given us in baptism. All of these are worthy and important needs. Pope Benedict XVI said that Peter's Pence “is the most characteristic expression of the participation of all the faithful in the Bishop of Rome’s charitable initiatives in favour of the universal Church. The gesture has not only a practical value, but also a strong symbolic one, as a sign of communion with the Pope and attention to the needs of one’s brothers; and therefore your service possesses a refined ecclesial character." You may also donate online with your credit card. Please be generous for every gift of any size is valuable; simply remember the widow's might. I know that I said it was tacky only a few days ago; nonetheless, I had to do it. Here are two pictures I took during the Mass, one after Bishop Lucas' homily and then after Communion. His Excellency was very kind to me that evening (not that he isn't whenever I see him). He thanked me for my assistance at the Mass and, before we both left the church for the last time, said to me: "Take care of yourself. You have the faith [to get through this]." He is right, of course, but then again there are wounds that time itself cannot heal. When I have time I will transcribe his homily and offer you the highlights. I find myself today - and yesterday - not back at Mundelein but in the State's Capitol and the See of the Diocese. I'm actually in the Cathedral rectory at this moment. I expect to be back in Effingham for the weekend before getting back to Mundelein, but - as they say - we'll cross that bridge when we get to it. My pastor's dear mother is dying and will probably die later today. Rather than driving up to Mundelein only to return again to alleviate the pastor's work load, I am staying around to do whatever I can to help him and his family. Please keep his mother in your prayers. I spent a good part of yesterday afternoon with them - and will head to hospital in just a few minutes. When life settles down just a bit and I'm in the same location for two solid days, I'll try to finally offer some reflections on the closing of my home. The Quincy Herald-Whig: "One last time: Final Mass at St. John the Baptist Catholic Church a 'joyful and sorrowful' experience"
Mother of Sorrows, pray for us! -Detail of Our Lady's altar, St. John the Baptist church, Quincy, Illinois. This morning I went to the church to continue taking pictures of the magnificent edifice. I will return to continue the project in a few minutes, spending, I expect, the rest of the day in my home that will soon be no more. ...for my car, not my computer or the golf course. In the course of just four days' time I will have made a sort of tour of Illinois, with stops in various places for ocassions both joyous and heart-wrenching. Saturday morning several of us from the Liturgical Institute visited the Newberry Library in Chicago. We were shown a few treasures of the library: medieval liturgical texts (pictures will be up in the next couple of days). From the Newberry Library I hopped in my car and made four hour the drive to Springfield. Once the post-ordination duties were seen to on Sunday, drove two hours to Effingham to collect my mail from the last two weeks. Today I drove from Effingham to Quincy, a four hour trip. I have returned to Hobbiton - which at the moment feels quite a lot like Mordor - for the final Mass to be celebrated in my home church of St. John the Baptist. His Excellency, Bishop Lucas, will be the presiding celebrant of this last Mass to be concelebrated by priests of the area Tuesday evening at 6:30 (a last Mass at St. Boniface church will celebrated by Bishop Lucas on Thursday evening at 6:30). I will be on hand to serve as the Master of Ceremonies. Some time in the near future, as I understand it, my home church (with the rectory and school) will be placed on the market. This evening I was able to have supper with my brother's family at one of my favorite restaurants. All three of us had a fried catfish with lattice fries (Quincyans will, no doubt, immediately know where we ate). My nephew Matthew is doing well and is beginning to walk. He can take, I believe, five steps in a row now. He will be one year old next month. Our waitress kept calling him "precious;" I think she's right. I beg your prayers throughout these next several hours. I will be in special need of them tomorrow evening. Sunday's mass ordination went very well, I am happy to say and lasted two hours and three minues, which must be a record of some kind. The principle Master of Ceremonies and I work well together, though we have to start meeting at times other than large Diocesan functions when we are both fairly stressed. The Cathedral of the Immaculate Conception was full, though not exactly jam-packed. Ordinarily one is disappointed when fewer people than expected turn out, but Sunday we were quite happy. We were expecting some two hundred people standing outside on the steps, but only fifteen or so were without pew space and stood in the back of the Cathedral. The eighteen candidates for ordination to the Sacred Order of Deacons were joined by five permanent deacons (two of whom assisted Bishop Lucas) and some forty-five or more priests. Candidates of the diaconate class of 2009 served the ordination. The readings and prayers for the Solemnity of the Nativity of John the Baptist were used. In his homily, Bishop Lucas reminded the candidates for ordination that the honor they have now received is greater than that of the Baptizer because of the grace of the Sacraments. The processional hymn was "Praise to the Lord, the Almighty," one of my personal favorites. My hearty congratulations to each of our new deacons! I look forward with great joy to working with them in the years ahead. 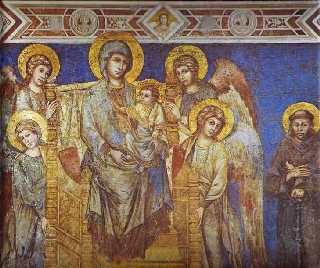 And we humbly beseech the glorious Mother, the Most Blessed Mary ever-Virgin, blessed Michael, Gabriel and Raphael and all the choirs of the blessed Seraphim, Cherubim, Thrones, Dominations, Principalities, Powers, Virtues, Angels, Archangels, blessed John the Baptist, John the Evangelist, Peter, Paul and the blessed Patriarchs, Prophets, [Holy] Innocents, Apostles, Evangelists, Disciples, Martyrs, Confessors, Virgins, blessed Elijah and Enoch, and all the Saints, who were and will be and are, for the sake of Thy love, to return thanks to Thee on behalf of these things, as pleases Thee, the Highest True God, eternal and living, with Thy most dear Son, Our Lord Jesus Christ, and the Holy Spirit, the Paraclete, "unto the ages of ages" (Rev. 19:3). "Amen. Alleluia" (Rev. 19:4). In the lives of Saints John Fisher and Thomas More we see two men who "store[d] up treasures in heaven" (Matthew 6:20), confident that "from all their distress God rescues the just" (Responsorial Psalm antiphon). As he stood upon the scaffold, John Fisher – the only English Bishop to oppose King Henry VIII’s Oath of Allegiance - said to those gathered around: "Christian people, I am come hither to die for the faith of Christ’s Holy Catholic Church, and I thank God hitherto my stomach hath served me well thereunto, so that yet I have not feared death." 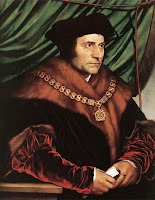 With the Bishop of Rochester, the Lord Chancellor Thomas More – the first layman appointed to this post - also trusted fully in the Lord, not fearing even death. To his daughter, Margaret, he wrote: "Do not let your mind be troubled over anything that shall happen to me in this world. Nothing can come but what God wills. And I am very sure that whatever that be, however bad it may seem, it shall indeed be the best." Together these holy martyrs call us to consider not only our trust in the Lord, by how well we conform our lives to the high calling that is given us as adopted sons and daughters of God. Too often do we seek the easy way out, as it were, begging God to remove all hardships and difficulties from our lives, whatever they may be. It is precisely in these moments that these martyrs not only urge us to place all our hope and trust in God, but they show us how to do so. It was Thomas More who wrote to his children, saying, "We cannot go to heaven in featherbeds." We attain heaven through a sharing in the Cross of Christ. Thomas and John knew well what Jesus meant when he said, "If anyone wishes to come after me, he must deny himself and take up his cross daily and follow me" (Luke 9:23). This these holy martyrs did. Standing upon the scaffold, the Lord Chancellor of England said, "I die the King’s good servant and God’s first." 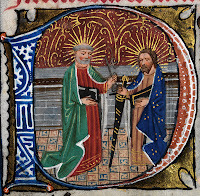 The weakness of which both John and Thomas may boast is their unwavering loyalty to God and his Church, this loyalty that led them reject the power and prestige of this world. Saint Francis of Assisi often said, "the saints lived lives of heroic virtue, [but] we are satisfied to talk about them." We must do more than simply talk about the lives of the saints; we must emulate them and follow in their footsteps, confidently trusting in the will of the Lord and going where he calls. Let us, with John and Thomas, place our treasure in the Cross of Christ, that we, too, may "remain faithful until death" and receive "the crown of life," standing forever in the glory of Christ our King (Revelation 2:10). ...for priests - and now deacons - to be transferred or reassigned. 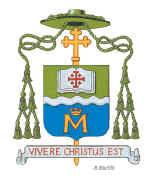 Bishop Lucas has had his hands full of assignments recently and they have been announced today in the Catholic Times. As difficult as it is for a parish to lose a beloved priest, it is equally difficult for a priest to leave a beloved parish. It can also be quite daunting to move into a different parish. At this time of year, prayer for the priests who are transferred and assigned as well as for their parishes. On the Solemnity of the Nativity of Saint John the Baptist (24 June 2007), His Excellency, the Most Reverend George J. Lucas will ordain eighteen (18) men to the Order of Deacons for service to the Diocese of Springfield in Illinois. This will be the first "class" of "permanent" deacons the Diocese has ordained and I am greatly looking forward to their ministry. I am happy to say that Deacon Joe Emmerich, from the parish at which I am assigned, has been assigned to assist the Pastor of the same parish. The ordination Liturgy - which promises to be standing room only - will begin at 2:00 in the afternoon in Springfield in the Cathedral of the Immaculate Conception. Yours truly will be serving as the Assistant Master of Ceremonies and at this moment I am thinking: logistical nightmare. Nonetheless, it will be a joyous and glorious day! Please join me in thanking God for the gift of these deacons, asking that their ministry will bear much fruit! How glorious, how holy and wonderful it is to have a Father in heaven. How holy it is, how beautiful and lovable to have in heaven a Bridegroom. How holy and beloved, how pleasing and lowly, how peaceful, delightful, lovable and desireable above all things it is to have a Brother like this, who laid down his life for his sheep (cf. Jn 10:15), and prayed to his Father for us. Where there is Patience and Humilty, there is neither Anger nor Annoyance. The American Papist has another good Papal Picture of the Day. The official English translation of the Holy Father's Angelus Address in Assisi is up. We're still waiting for the others, and for the official pictures. 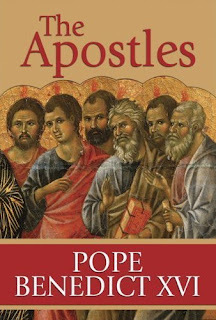 The Holy Father's Wednesday Audience Addresses on the Apostles will be published soon. This, and more, via Amy. If you haven't yet read these addresses, shame on you! Within each address Pope Benedict XVI offers a brief biographical sketch of the Apostles and proposes several things we can learn from the example of their lives. Each of these addresses is both educational and highly spiritual. Order your copy today! A must read for every faithful Catholic! There are those accustomed to thinking of St. Francis of Assisi as the innocuous patron of the local bird bath, a charming but basically harmless lover of nature, a simple-minded but peace-loving man. Then there is the reality. Bishop Trautman is clearly a man of intelligence and learning, so it’s all the more puzzling why he seems to defend the indefensible. For how can anyone with a sense of the majesty of the English language defend the See-Spot/See-Spot-Run vocabulary and syntax the new ICEL translations are intended to replace? Let's see then, so far we have the following lay persons speaking in favor of the forthcoming translation of the Missal: Open Book, Happy Catholic, the Curt Jester and George Weigel. Fr. Martin Fox has also chimed in. That's not a bad start. With the recent talk of translation, I simply cannot resist passing along this little jewel from Father Z. that he found while reading the recent Guidelines for the Pastoral Care of the Road. Along this vein, The Crescat offers us The Cannonball's 10 Commandments for Driving. I agree very much with numbers five and nine. Every creature in heaven and on earth and in the depths of the sea should give God praise and glory and honor and blessing (cf. Rev. 5:13); he has borne so much for us and has done and will do so much good to us; he is our power and our strength, and he alone is good (cf. Lk 18:19), he alone most high, he alone all-powerful, wonderful, and glorious; he alone is holy and worthy of all praise and blessing for endless ages and ages. Amen. A Catholic Mom in Hawaii has tagged for the new carnival meme that originated at Don't Try This at Home involving a series of eight questions. I'm not entirely sure what the carnival part means, but here goes. I started while I was in the seminary (on the 8th of January 2005, in fact) as a way to keep in touch with family and friends. I had been sending out an e-mail newsletter of sorts (The Seminarian Gazette) but each issue was getting lengthier and I couldn't always remember the good stories that long. I began the blog to replace the e-mail but very few followed me over. 2. Did you intend to have a blog with a big following? If so, how did you go about getting it? Not at all, really. I had hoped that fifty or so from the e-mail list of nearly two hundred would come but they didn't. Over the past several months, however, I have noticed a steady increase of visitors. I attribute the beginning of the growth to the Roving Medievalist who, I think, first brought my blog to the attention of the blogosphere. After his link others began linking and it grew and grew. When I first signed up with Site Meter, my blog had 406 visits for the month of January 2007. In May, 2,404 people visited my blog. As of right now, 1,527 people have visited my blog. I'm now averaging around 100 visits per day, which I consider large. I'm not really sure why people keep coming. I suppose I keep offering something they like. So long as they keep visiting I'll keep blogging. 3. What do you hope to achieve or accomplish with your blog? Have you been successful? If not, do you have a plan to achieve those goals? I simply hope to explore the mystery of the Christian Faith through my shared homilies and other bits that I post. I also hope to help people see that priests have individual personalities and are just as human as they are. This blog is a way to share my loves with other bloggers. I think I've been successful at this, judging from the range of people reading my blog. 4. Has the focus of your blog changed since you started blogging? How? Not really. It has expanded, but it hasn't changed. 5. What do you know now that you wish you'd known when you started? That the posts I hoped would trigger big discussions wouldn't; instead it would be the posts I thought odd and silly that would trigger the largest discussions. Even so, I don't think this is a bad thing. 6. Do you make money with your blog? 7. Does your immediate or extended family know about your blog? If so, do they read it? If not, why? 8. What two pieces of advice would give to a new blogger? First, my answer to question 5. Second, that you just never know who will stumble upon your blog, and that you might actually meet some of the people who read your blog (Thanks, Esther!). I do hereby tag Thom of Ad Dominum and Jeffrey of the Roving Medievalist. God is our strong Dad, and he made everything.He has a Son, Jesus, who tells us what to do. He's a lot like his Dad and has been around forever. He made everything, too. Mary was His Mom because God made it happen and because Jesus wanted to help us. Jesus had a hard life, died on a piece of wood shaped like an X, and was put in the hole in the ground. After 3 days he was alive and went to a happy place next to his Dad. He's coming back someday to tell us how we're doing. The good part of God who has no body tells us what to do, too, and keeps us living and he gave some people some good things to write about a long time ago. We clap and sing and thank all of God. There's one good church that's everywhere and that's been around a long time. There's one washing away of the bad stuff we have. We are happy that we will live after we die. We are happy that we will be happy someday in a happy place for a long, long happy time. Greetings Mary, jam-packed with grace.The big Guy is with you.You are really a stand-out compared to other women.And awesome is the product of your uterus. Jesus.Really good person, Mary, God's mommy, Ask God to look the other way at our goof-ups.Now, and when a doctor decides my quality of life is not worth living. Okay. Ever so slowly the tide is turning. Each day, if one looks properly, the signs are readily apparent. As just one more example, the Most Reverend Arthur J. Serratelli, Bishop of Patterson, has recently begun a series of articles exploring the "loss and the recovery of the sense of the sacred in Catholic life." This first installment is quite good; do read it in its totality. Fr. Z. adds his own comments here. It is interesting to compare Bishop Serratelli's thoughts with those of Bishop Trautman. Amy has a lengthy and excellent response to Bishop Trautman's article in America magazine regarding the proposed translation of the Missal. While browsing through Barnes & Noble with Father Jason we discovered a little work by Eugene H. Peterson entitled, The Message: The Bible in Contemporary Language (Colorado Springs, Colorado: NavPress, 1995). Maybe you've see it. It is a "translation" of the New Testament, the Psalms and the book of Proverbs because the rest of the Old Testament apparently is not important any longer. Mark 15: "They offered him a mild painkiller (wine mixed with myrrh), but he wouldn't take it." Luke 1: "Upon entering, Gabriel greeted her: 'Good morning! You're beautiful with God's beauty, Beautiful inside and out! God be with you.' ... Mary said to the angel, 'But how? I've never slept with a man.' ... And Mary said, 'Yes, I see it all now: I'm the Lord's maid, ready to serve.'" Luke 9: "Jesus was curt: 'Are you ready to rough it? We're not staying in the best inns, you know.'" John 6: "They waffled: 'Why don't you give us a clue about who you are, just a hint of what's going on?' ... Jesus said, 'I am the Bread of Life. The person who aligns with me hungers no more and thirsts no more, ever. I have told you this explicitly because even though you have seen me in action, you don't really believe me.' ... 'Don't bicker among yourselves over me. You're not in charge here.' ... But Jesus didn't give an inch." Psalm 6: "Please, GOD, no more yelling, no more trips to the woodshed. Treat me nice for a change, I'm so starved for affection." Psalm 15: "GOD, who gets invited to dinner at your table? How do we get on your guest list?" Psalm 22: "GOD, GOD ... my GOD! Why did you dump me miles from nowhere?" And, for my favorite one, Psalm 38: "I've lost twenty pounds in two months because of your accusation." You think I'm making this up, but I assure you that I'm not. I'm not nearly creative enough. We students here at the Liturgical Institute laughed over these - and other - "translations" for a good two hours the other night. I would give you the verses from which these quotations are culled, but the verses are mysteriously absent, as are good parts of the Scriptures. I went looking to see how The Message translated what we know as "Surely there will be a stench" only to discover that they apparently just rolled the stone away without complaining at all. The next time you lament the current quality or accuracy of our liturgical texts simply remember that it could be worse, much worse. 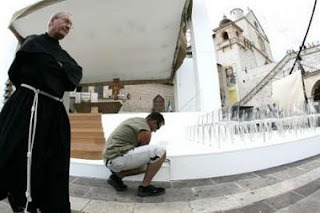 UPDATED: 21 June 2007, 10:43 a.m.
Be sure to keep checking back for the latest on the Holy Father's upcoming pilgrimage to the tomb of Saint Francis of Assisi. I will find a way to keep this post at the top of the blog. The official Vatican site for the Pastoral Visit to Assisi is up. You might remember the motu proprio by which Pope Benedict XVI placed the care of the Baslicas of St. Francis of Assisi and of St. Mary of the Angels under the control of the Diocesan Bishop. Ignatius Press sells the excellenct Italian Movie Saint Francis. It is well worth watching. The Catholic Liturgy is luminous in its very mysteries, balanced and respectful in its very magnificence; everything in it is ordered, and even that which calls most strongly to our being at the level of the senses comes by its meaning only through faith. Its fruit is joy but the lesson it teaches is one of austerity; the sacrifice which is its centre is a symbol and representation of the passion of the Lord, and the sacrament of His sacrifice, and the memorial of His death. Through the communion which is its consummation it feeds us on His Cross, and it would be of no value if it did not bring about interior sacrifice in all those who take part in it. His Excellence, the Most Reverend Donald Trautman, Bishop of Erie, has recently written a criticism of the proposed translation of the forthcoming Missal in America magazine. Happy Catholic has an excellent response to Bishop Trautman's thoughts. I shall simply refer you to her response. 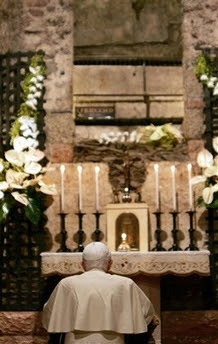 Praying at the tomb of Francis. My two favorite people in the same room. Praying before the San Damiano crucifix that spoke to Saint Francis. 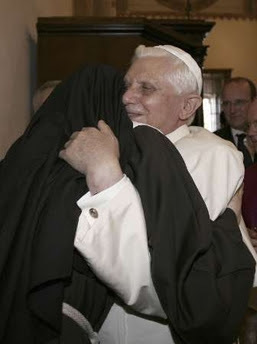 That nun [Sister Immaculata, Mother Superior] might well have the greatest honor in the world! Through the workings of Divine Providence, the Lectionary readings for the Eleventh Sunday in Ordinary Time, which coincides this year with the celebrations marking the eight-hundredth anniversary of the conversion of Saint Francis of Assisi, speak of conversion and forgiveness. As I have already remarked, His Holiness beamed processing into the piazza for the celebration of the Holy Mass. 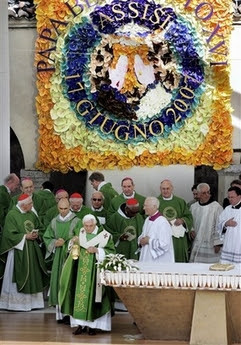 At the same time, the faithful welcomed him with great joy and true festivity. The Holy Father truly and deeply loves his flock even as his flock truly and deeply loves their shepherd. How I wish I were there! Seeing his beautiful smile, tears welled up in my eyes. May the Lord grant him many more years of a glorious reign! On another note, too many of the concelebrating clerics are wearing ball caps. That's what sunglasses are for. Archbishop Sorrentino welcomed the Holy Father with a joy apparent in his voice and when the Pontiff spoke the opening words of the Mass a manifest joy was in his voice, as well. The music - including the chant tones - seems to be one not used at Papal Liturgies prior to this pastoral visit. Saint Francis' prayer before a crucifix was sung after Holy Communion and his Canticle of the Sun was sung as the recessional. 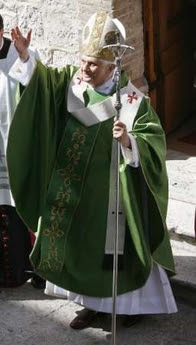 As in the past, the Holy Father was vested in a green chasuble, choosing to vest according to the liturgical calendar. In this way Pope Benedict XVI keeps the focus off of himself and on Christ. He will not allow a Papal Liturgy to top, as it were, the Sunday celebration. "What do we want to speak of today but the Lord?" he asked as he began his homily. The choir sang the Alleluia after the proclamation of the Gospel while the Holy Father blessed the faithful with the Book of the Gospels. Is this normal? He has brought with him the beautiful mitre that he wears so frequently. He seems to have a handful of mitres that he prefers. A Franciscan nun was on hand to translate the Mass into sign language. 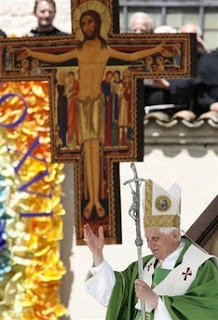 In his homily for today's celebrations, Pope Benedict XVI spoke as the teacher par excellence that he is. One line that I caught and that stuck with me as I was searching for news items was, "When we turn towards love we turn from bitterness to sweetness..." More on the homily will come when it is available. The overall pace of this Papal Liturgy seems to be moving a bit faster than it typically does at the Vatican. Perhaps this is because of a smaller space, although the piazza in Assisi isn't exactly small. The peace of Assisi pervades today's celebrations as people camp out on rooftops for a better view. The congregation is large but it doesn't seem as boisterous or distracted as it often does in St. Peter's Square. Everyone who has been blessed enough with the opportunity to visit this holy city knows of this peace. Saint Francis and Saint Clare are surely smiling down upon the Holy Father today. As I offer my observations I must say that I am disappointed at how little attention this pastoral visit has received in the Catholic blogosphere and in the Catholic news media. Not only is this the 8th centenary of the conversion of Catholicism's arguably most popular saint - even if severely misunderstood - it also a pastoral visit of the Holy Father that can be a tremendous aid to evangelization. The next time the Holy Father travels lets get on top of it and give the pastoral visit the attention it rightly deserves. 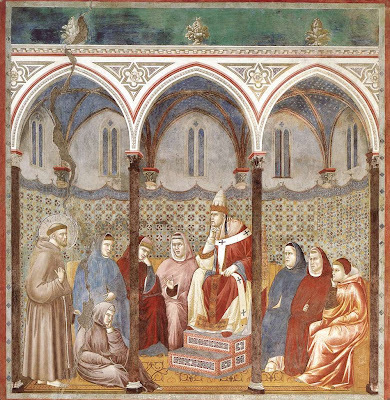 Be sure to ask the Lord to bless abundantly those many men and women throughout the world who follow the Rule of Saint Francis and of Saint Clare, together with the many laity who follow the example of this holy man and woman as secular Franciscans. Now, as the first rays of dawn are detectable, I am off to bed for a few more hours' sleep before concelebrating Mass. Moving into the piazza of the Basilica of St. Francis for Mass, the Holy Father is all smiles; he is beaming, really. I love this Pope! Plainly a life such as his, so holy, so passionate, so brilliant, was enough to win him a place in the Church Triumphant. 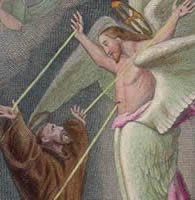 Yet, because the Church Militant, which can only observe the outer appearances, does not presume to judge on its own authority those not sharing its actual state, it proposes for veneration as Saints only those whose lives on earth merited such, especially because an angel of Satan sometimes transforms himself into an angel of light (II Cor 11:14). In his generosity the omnipotent and merciful God has provided that the aforementioned Servant of Christ did come and serve Him worthily and commendably. Not permitting so great a light to remain hidden under a bushel, but wishing to put it on a lampstand to console those dwelling in the house of light (Mt 5:15), God declared through many brilliant miracles that his life has been acceptable to God and his memory should be honored by the Church Militant. Therefore, since the wondrous events of his glorious life are quite well known to Us because of the great familiarity he had with Us while we still occupied a lower rank, and since We are fully convinced by reliable witnesses of the many brilliant miracles, We and the flock entrusted to Us, by the mercy of God, are confident of being assisted at his intercession and of having in Heaven a patron whose friendship We enjoyed on earth. With the consultation and approval of our Brothers (i.e. the cardinals), We have decreed that he be enrolled in the catalogue of saints worthy of veneration. 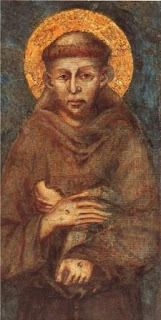 Some eight centuries ago Saint Francis of Assisi embarked on a journey to Rome to ask Holy Father Pope Honorius III for permission to establish the Order of Friars Minor. In just a few hours' time, the Holy Father Pope Benedict XVI will embark on a journey to the tomb of the Poverello, always a faithful servant of the Church. 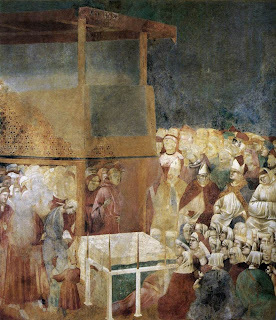 In Giotto's fresco pictured above, Saint Francis of Assisi preaches to Pope Honorius III. 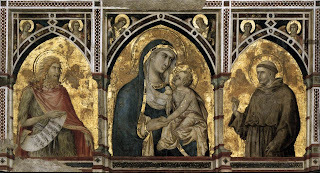 With the help of a priest-friend, I have been searching for a cheap flight from Chicago (or somewhere nearby) to Europe, with the final destination being, of course, Assisi. The cheapest we've managed to find for the weekend is $1,200. That's beyond my range. Does anybody have any suggestions? My only requirements are that I arrive in Assisi by Sunday morning. I can return to the U.S. whenever, as long as it's before June 20th. Sandro has a fine examination of Pope Benedict XVI's thought on St. Francis of Assisi (from 11 September 2006). The Holy Father's comments on the Seraphic Father to the priests of Albano on 31 August 2006 and the Holy Father's letter to the Bishop of Assisi on 2 (or 4?) September 2006. What the Holy Father says this weekend will surely be just this good! 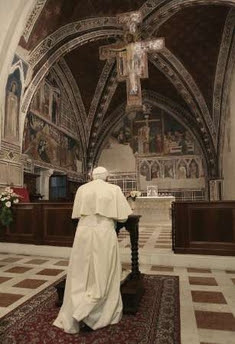 VATICAN CITY, JUN 15, 2007 (VIS) - On Sunday, June 17, Benedict XVI will make a pastoral visit to Assisi, Italy, for the eighth centenary of the conversion of St. Francis. The Pope will leave the Vatican by helicopter at 7.30 a.m. After landing at the heliport of Rivotorto, he will make a private visit to the Shrine of St. Damian. At 10 a.m., he will preside at a Eucharistic concelebration in the Lower Square of St. Francis then pray the Angelus. 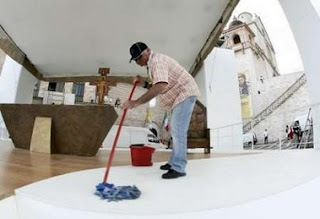 At 12.30 p.m., he will make a private visit to the tomb of St. Francis. At 4 p.m., he will meet the German Poor Clare Capuchin Sisters in the hall of the convent before going on to the Upper Basilica of St. Francis to meet participants in the general chapter of the Franciscan Order of Friars Minor Conventual and the community of the convent. Following a meeting with priests, deacons, religious, superiors and students of the pontifical seminary of Umbria in the Cathedral of San Rufino, he will make a private visit to the shrine of Porziuncola and the chapel of St. Francis. At 6 p.m., he will meet with young people on the square in front of the Basilica of St. Mary of the Angels. His return to the Vatican is scheduled for 7 p.m. Updated: EWTN will broadcast the Mass live at 4:00 a.m. Eastern time June 17th. Let's see...that's...3:00a.m. local time for me... The Mass will be rebroadcast at 12:00 p.m. Eastern time. 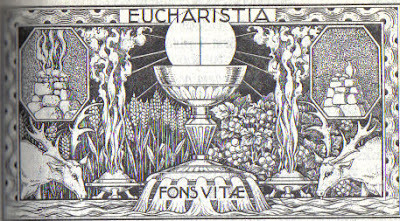 Today, 50 years later, the Prophet Isaiah's words, which Pius XII placed at the beginning of the Encyclical with which he commemorated the first centenary of the extension of the Feast of the Most Sacred Heart of Jesus to the entire Church, have lost none of their meaning: "With joy you will draw water from the wells of salvation" (Is 12: 3). The Redeemer's pierced side is the source to which the Encyclical Haurietis Aquas refers us: we must draw from this source to attain true knowledge of Jesus Christ and a deeper experience of his love. Thus, we will be able to understand better what it means to know God's love in Jesus Christ, to experience him, keeping our gaze fixed on him to the point that we live entirely on the experience of his love, so that we can subsequently witness to it to others. Indeed, to take up a saying of my venerable Predecessor John Paul II, "In the Heart of Christ, man's heart learns to know the genuine and unique meaning of his life and of his destiny, to understand the value of an authentically Christian life, to keep himself from certain perversions of the human heart, and to unite the filial love for God and the love of neighbour". Thus: "The true reparation asked by the Heart of the Saviour will come when the civilization of the Heart of Christ can be built upon the ruins heaped up by hatred and violence" (Letter to Fr Peter-Hans Kolvenbach, Superior General of the Society of Jesus for the Beatification of Bl. 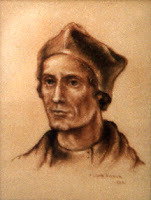 Claude de la Colombière, 5 October 1986; L'Osservatore Romano English edition, 27 October 1986, p. 7). In the Encyclical Deus Caritas Est, I cited the affirmation in the First Letter of St John: "We have come to know and to believe in the love God has for us", in order to emphasize that being Christian begins with the encounter with a Person (cf. n. 1). Since God revealed himself most profoundly in the Incarnation of his Son in whom he made himself "visible", it is in our relationship with Christ that we can recognize who God really is (cf. Haurietis Aquas, nn. 29-41; Deus Caritas Est, nn. 12-15). And again: since the deepest expression of God's love is found in the gift Christ made of his life for us on the Cross, the deepest expression of God's love, it is above all by looking at his suffering and his death that we can see God's infinite love for us more and more clearly: "God so loved the world that he gave his only Son, that whoever believes in him should not perish but have eternal life" (Jn 3: 16). Indeed, it is only possible to be Christian by fixing our gaze on the Cross of our Redeemer, "on him whom they have pierced" (Jn 19: 37; cf. Zc 12: 10). The Encyclical Haurietis Aquas rightly recalls that for countless souls the wound in Christ's side and the marks left by the nails have been "the chief sign and symbol of that love" that ever more incisively shaped their life from within (cf. n. 52). Recognizing God's love in the Crucified One became an inner experience that prompted them to confess, together with Thomas: "My Lord and my God!" (Jn 20: 28), and enabled them to acquire a deeper faith by welcoming God's love unreservedly (cf. Haurietis Aquas, n. 49). The deepest meaning of this devotion to God's love is revealed solely through a more attentive consideration of its contribution not only to the knowledge, but also and especially to the personal experience of this love in trusting dedication to its service (cf. ibid., n. 62). Starting with this interior attitude, one sees that the gaze fixed upon his side, pierced by the spear, is transformed into silent adoration. Gazing at the Lord's pierced side, from which "blood and water" flowed (cf. Jn 19: 34), helps us to recognize the manifold gifts of grace that derive from it (cf. Haurietis Aquas, nn. 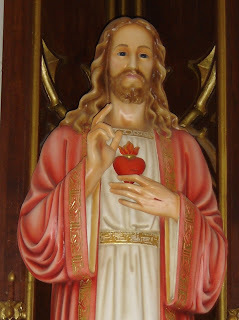 34-41) and opens us to all other forms of Christian worship embraced by the devotion to the Heart of Jesus. Faith, understood as a fruit of the experience of God's love, is a grace, a gift of God. Yet human beings will only be able to experience faith as a grace to the extent that they accept it within themselves as a gift on which they seek to live. Devotion to the love of God, to which the Encyclical Haurietis Aquas invited the faithful (cf. n. 72), must help us never to forget that he willingly took this suffering upon himself "for us", "for me". When we practise this devotion, not only do we recognize God's love with gratitude but we continue to open ourselves to this love so that our lives are ever more closely patterned upon it. God, who poured out his love "into our hearts through the Holy Spirit who has been given to us" (cf. Rom 5: 5), invites us tirelessly to accept his love. The main aim of the invitation to give ourselves entirely to the saving love of Christ and to consecrate ourselves to it (cf. Haurietis Aquas, n. 4) is, consequently, to bring about our relationship with God. This explains why the devotion, which is totally oriented to the love of God who sacrificed himself for us, has an irreplaceable importance for our faith and for our life in love. Whoever inwardly accepts God is moulded by him. The experience of God's love should be lived by men and women as a "calling" to which they must respond. Fixing our gaze on the Lord, who "took our infirmities and bore our diseases" (Mt 8: 17), helps us to become more attentive to the suffering and need of others. The gifts received from the open side, from which "blood and water" flowed (cf. Jn 19: 34), ensure that our lives will also become for others a source from which "rivers of living water" flow (Jn 7: 38; cf. Deus Caritas Est, n. 7). The experience of love, brought by the devotion to the pierced side of the Redeemer, protects us from the risk of withdrawing into ourselves and makes us readier to live for others. "By this we know love, that he laid down his life for us; and we ought to lay down our lives for the brethren" (I Jn 3: 16; cf. Haurietis Aquas, n. 38). So it is that the cult of love, which becomes visible in the mystery of the Cross presented anew in every celebration of the Eucharist, lays the foundations of our capacity to love and to make a gift of ourselves (cf. Haurietis Aquas, n. 69), becoming instruments in Christ's hands: only in this way can we be credible proclaimers of his love. However, this opening of ourselves to God's will must be renewed in every moment: "Love is never "finished' and complete" (cf. Deus Caritas Est, n. 17). Thus, looking at the "side pierced by the spear" from which shines forth God's boundless desire for our salvation cannot be considered a transitory form of worship or devotion: the adoration of God's love, whose historical and devotional expression is found in the symbol of the "pierced heart", remains indispensable for a living relationship with God (cf. Haurietis Aquas, n. 62). Yesterday evening a group from the Liturgical Institute went to hear Mr. George Weigel speak on the topic of Pope Benedict XVI and the future of the Church. I am very glad that I went. Mr. Weigel has, of course, been covering and reporting on the Catholic Church for many years. In addition to this, he has a sharp intellect and a good grasp of the state of things cultural and religious. If you ever have the chance to hear Mr. Weigel speak, do so. It is well worth it. Mr. Weigel is a devout Catholic himself and so has a keen interest in the things of which he speaks. He is very knowledgeable about Church history, theology, liturgy and most everything else, it seems. 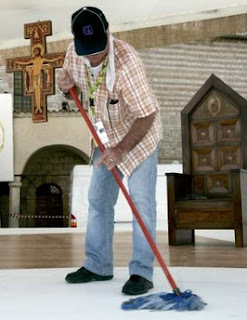 His thought his merely a job, but is a great service to the Church. When we arrived I realized that I forgot to bring a pen with me (paper I had) so I regret to say that I cannot give you an adequate description of what he said, but I assure you it was excellent. He seems to have his finger on just the right pulse. In case you missed, A Catholic Mom in Hawaii has posted forty small ways to become a saint. Do have a look. In 1946, Pope Pius XII declared Saint Anthony of Padua a Doctor of the Church giving him the title of the Evangelic Doctor. 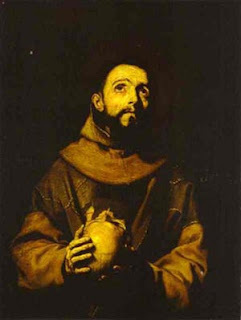 It is an eminently fitting title for this son of Saint Francis of Assisi who loved his education and knowledge, but who loved Christ Jesus more. Having encountered the bodies of five Franciscans martyred in Morocco, Anthony was filled with a great desire to give his life for the Gospel in the same way. He left the Augustinians -whom he joined ten years earlier - and entered the Order of Friars Minor upon condition that he would be sent to Morocco to die there a martyr’s death. Yet, as is so often the case, the gift that Anthony wanted so desperately to give was not the gift that the Lord would ask of him. Falling ill upon arrival in Morocco, Anthony boarded a ship headed back to Portugal and, after enduring heavy storms at sea, found his way to Sicily instead. The excellent knowledge he acquired with the Augustinians – and his own deep intellect – he kept secret from the Franciscans, never speaking of it. It happened that his great gift was discovered at the ordination of Augustinian and Dominican priests in Forli. Apparently nobody was selected to preach. The Bishop then asked one of the Order of Preachers to preach but each of those present refused. The Franciscan superior ordered Anthony to preach whatever the Spirit told him. He opened his mouth and all were amazed at what they thought was an uneducated and simple man. To Brother Anthony, my bishop, Brother Francis sends greetings. It is agreeable to me that you should teach the friars sacred theology, so long as they do not extinguish the spirit of prayer and devotedness over this study, as it is contained in the Rule. Farewell. Anthony sought Francis’ permission Francis distrusted academics. Too often they lost their focus and turned from Christ Jesus to intellectual pursuits and pleasures, a reality with which we still live. Each of us is educated and seeks to continue our learning for service to the Church. The risk we share is to devote ourselves too much to our studies and so neglect the spirit of prayer to which each of us is called and to neglect our pursuit of the virtues. There is also another risk which education offers us, that of over-confidence and pride. The more that we know and understood the more we can be tempted to trust in our own intelligence and aptitude. Anthony succumbed to neither of these temptations because he knew, with Saint Paul, that "our qualification comes from God" and not from ourselves or our achievements (II Corinthians 3:5). His great intellect and knowledge were both a gift from the Lord and not of his making. When God unleashed Anthony’s tongue, the ministry of the Spirit was glorious indeed (cf. II Corinthians 3:8). His words moved people within the depths of their hearts because he followed the teaching of St. Francis who said, "The preacher must first draw from secret prayers what he will later pour out in holy sermons; he must first grow hot within before he speaks words that are in themselves cold." This Anthony did in his study of the Scriptures and through them he came not only to know Christ Jesus, but also to play with the Child Jesus and to hold him in his hands. As God bent low to embrace Anthony, so Anthony bent low to embrace God. In the embrace of God Anthony experienced his greatest joy. "What greater pleasure or joy can there be for the human mind," he asked, "than to be ‘before him’ with whom, and in whom, is all that is true; and without whom everything that seems to be is nothing, and all abundance only a lack?" Let us, with the Evangelic Doctor, seek our greatest joy not in intellectual pursuits but in Christ Jesus. I arrived Sunday evening at the Liturgical Institute at the University of St. Mary of the Lake/Mundelein Seminary and it is great to be back! I've been slowly settling into my room and visiting with former classmates and getting acquainted with those who are new to the program this year. I am back to continue work on my thesis and to complete a couple of papers still left over from last summer. At the same time I will be continuing a couple of other personal writing projects. The summer is divided into two three week sessions. This first session I will be auditing (I think) Sacramental Aesthtetics. We've met twice now and the class is very good and thought provoking. I'll post more once I get fully settled in and used to a new schedule and routine. 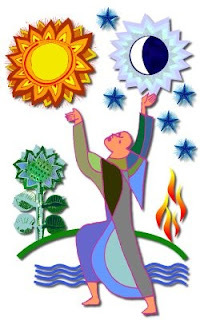 Having celebrated and reflected upon the central tenet of the Christian faith last Sunday, today Holy Mother Church proposes for our reflection that which is the “source and summit of the Christian life,” the Holy Eucharist. Notice in the Gospel proclaimed that Jesus first speaks to the crowd. Next he heals them of their illnesses. Finally, he feeds and satisfies them. The same is true for us today, and the movement is ever the same: first he teaches, second he heals, and third he feeds. The Lord Jesus Christ speaks to us, he teaches us and calls us to himself. Within the depths of our hearts he calls to us, gently and quietly. There is something strangely attractive and compelling about his voice. But hearing his voice we become conflicted within ourselves. On the one hand we want to listen this voice, this beautiful voice; yet, on the other, we somehow know that this voice will call us to put our plans and desires aside and to follow where he calls. We try – vainly - to ignore this voice that resonates within the depths of our heart, but he never stops calling us to heed him. When at last we do listen actively and intently, he begins to teach us in the ways of faith. He makes known to us the depth of our sin and the estrangement from God caused by sin. Jesus then teaches us to put our trust in him, to accept his gracious mercy and be reconciled with God. After teaching us, Jesus longs to heal us through the grace of the Sacraments. He will never force his healing upon us; rather, we must approach Christ, the divine physician, and ask him to lay his healing hands upon us. Throughout the Scriptures sin is likened to an illness. What is the remedy of our disease if not the Sacraments entrusted by Christ to the Church? The purpose of all of the Sacraments is “the healing of men through a proper medicine” and because of this they are rightly called “sacred medicaments” by which the Lord heals us. In the waters of Baptism we are cleansed of original sin and our relationship with God is restored. Through Confirmation we are strengthened with the fullness of the gifts of the Holy Spirit to faithfully follow Christ. Through the Holy Eucharist we are nourished spiritually and are united with Christ as our head. I received from the Lord what I also handed on to you, that the Lord Jesus, on the night he was handed over, took bread, and, after he had given thanks, broke it and said, “This is my body that is for you. Do this in remembrance of me.” In the same way also the cup, after supper, saying, “This cup is the new covenant in my blood. Do this, as often as you drink it, in remembrance of me.” For as often as you eat this bread and drink this cup, you proclaim the death of the Lord until he comes (I Corinthians 11:23-26). Because the Eucharist is the Body and Blood, Soul and Divinity of Christ, we must approach the altar of the Lord worthily out of humble respect for the majesty of the Lord and the greatness of the effects of this Sacrament. Therefore whoever eats the bread or drinks the cup of the Lord unworthily will have to answer for the body and blood of the Lord. A person should examine himself, and so eat the bread and drink the cup. For anyone who eats and drinks without discerning the body, eats and drinks judgment on himself (I Corinthians 11:27-29). This is why we are to arrive early for the sacrifice of the Mass, so that in conversation with the Lord we might examine our lives and consider how faithfully we follow him. If we find that we are guilty of grave sin, of mortal sin, we must not receive the Body and Blood of the Lord without sacramental confession, else we increase our sin and commit sacrilege by greatly disrespecting the Body and Blood of the Lord himself. As in the Gospel, Jesus wants to heal us of our sins and he has given us the means to be healed in the sacraments if only we make use of them. After teaching and healing us, Jesus desires to feed us with his very own Body and Blood so that we might have life (cf. John 6:53-57). In this way he will satisfy all of our deepest yearnings and desires because our hearts truly long for him. Through the Eucharist Christ changes us into himself and we become his Body, the Church, and he becomes our Head. May Holy Mary, Our Lady of the Eucharist, intercede for us, that we might approach the altar of the Lord worthily to receive his precious Body and Blood. Amen. Ilia Delio, The Humility of God: A Franciscan Perspective (Cincinnati, Ohio: St. Anthony Messenger Press, 2005), 17. Cf. Saint Bonaventure, The Breviloquium, VI. In The Works of Bonaventure, Vol. II: The Breviloquium, Jose de Vinck, trans. (Paterson, New Jersey: St. Anthony Guild Press, 1693), 223-226.